Published on February 17, 2011 by Wade Shepard Follow me on Twitter here. 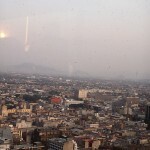 I was being yelled at, for I was caught red handed, stealing a view of Mexico City. 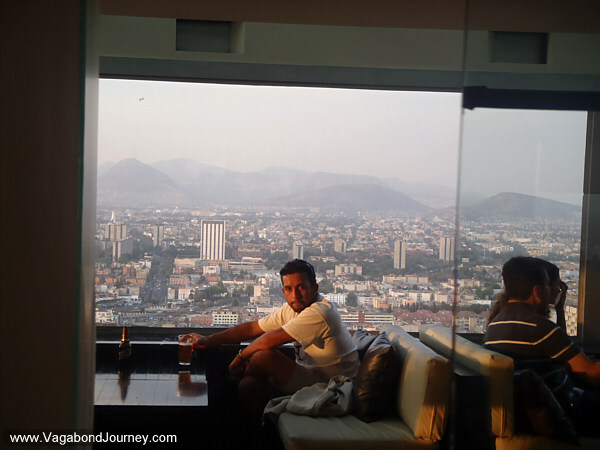 Such views are big commodities in the Latinoamericana tower, and, apparently, the theft of such is punishable by a shrill screamed from a twenty year old girl in a red t-shirt. It is rare in Mexico for someone to make such an ardent claim on their authority like this onerous wench. The observation deck is the 44th. The cost of a couple beers — even in an expensive restaurant — would not come near the charge for the observation deck: and we could claim the same view for free. Content with our plan, we continued battling the shrill little wench that kept us corralled in the center of the room on the 36th floor which had access to the elevator and stairwell that rose higher to to the restaurant and observation deck above. 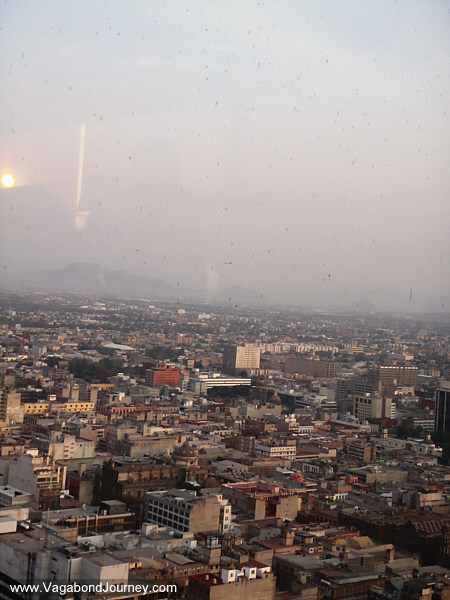 All around us were windows with a view of all of Mexico City. We kept stealing views. With each glace out across the windows which were only a few steps away, a curled up angry gaze would emit from the little bugger charged with making sure that no views of Mexico City would be stolen. 20 minutes past with us waiting at the foot of the elevator, peaking out the windows beyond. “Does she know that we just want to go to the f’çking restaurant?” I asked Alex. The girl reiterated that we would need to wait for a server to come down to get us. Alex got annoyed and boldly strode over to a window. This is his city, he can look at it if he wants to. I followed as an accomplace to the crime of view stealing. The girl squealed. “What is the difference if we wait here or over there?” Alex asked. There will be no view stealing on my watch, boy! I remained at the window, clearly insubordinate. The logic here escaped me: I was in the same room as I was told to wait in, only I walked a few steps over to the window. Not allowed. She was getting urgent now, pleading — from her now helpless tone of it was obvious that she had no contingency plan beyond squealing at an insubordinate window looker. Dammit, this girl knew we were scumbagging her tower. I eventually complied and returned to the center of the room, huddled next to the elevator with around 10 or so other people waiting to go up to the tower’s museum. Annoyed with the idiocy, my friends discussed if it would be worth climbing up a few more stories for a higher view of the city. Do we really want to continue subjecting ourselves to this? “Do you feel that you stole enough of a view?” Caitlin asked us. We peered out the 360 degrees of windows one last time from the center of the waiting area and agreed to depart: the little guard would win the day. But, suddenly and unexpectedly, the server for the restaurant appeared at the door of the elevator. Alex, annoyed with his people, explained to her that we were kept waiting for over a half hour by the elevator. The server seemed confused at why we had to wait, that we could have come right up. She was smiling, friendly, seemed surprisingly logical, human. The group of people going to the museum waiting piled into the elevator but my friends and I headed for the stairs, gloating our newfound independence as we left the chirping little guard in the red shirt in the dust. 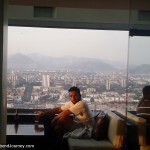 We jogged up the few flights of stairs to the restaurant — one floor below the top of the tower. The restaurant was immaculate. The view of the city was visible from each of the cardinal directions, the walls were all window. Cool. The server showed us to an empty table by a window. Our “fellow” diners were a splattering of Mexico’s rich. They tried not to see us. We look as monsters in such a setting. But we were too busy with our faces plastered against the windows to care or notice. The server brought us the menu. Friggin expensive — of course — but beers sold for 35 pesos, a price worth the view I had to admit. The server then disappeared for good. A half hour went by. Ten minutes on top of that. 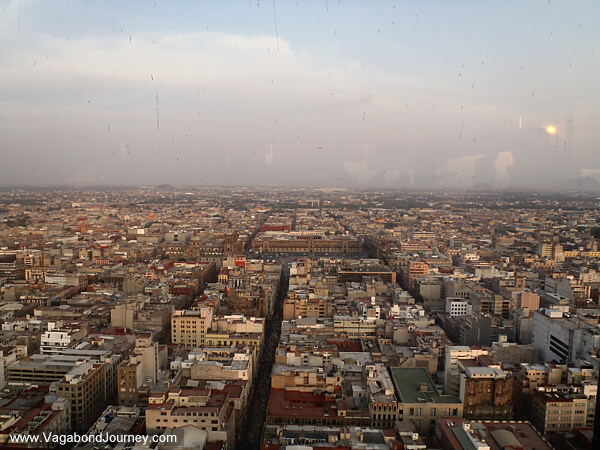 We spent this time looking at all of Mexico City. 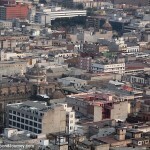 The city grid of the Aztecs moved away from us into the distance, the sky scrapers of the modern age rose up in clumps and patches behind us. 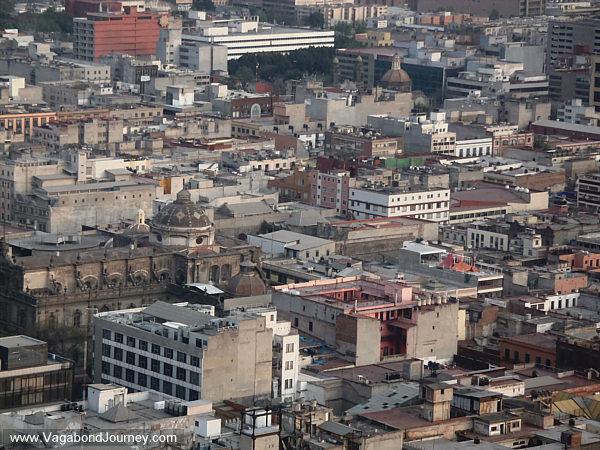 Mexico is a fatso city — not tall but wide, stretching out to meet the mountains that form a circle on the horizon. We all sat in awe from the best seats in the city. We took the chance, scrammed without ordering anything — the visuals of the view over Mexico City stashed in our heads, the images claimed by our cameras. The heist completed. What a caper. It gave me such a thrill. Funny how trying to be crafty and get something for free is generally vastly more fun than paying hehehe. About to visit my father in mexico and have really enjoyed your last two posts. Thanks. This is possibly the best mexico city writing I’ve read so far. This is truly appreciated. Have fun here, this is a great city. 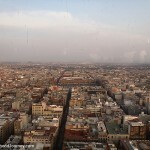 Previous post: What is Mexico City Like?